Every Monday morning from September to May, volunteers will gather at St. Michael’s church hall in Canonsburg, Pa.
for their annual Nutroll Fundraiser. the rolls and finally wrap with tender-loving care for sale. This special year started off with the retirement of Betty and John Sopiak who mixed three to five batches of dough and nuts for more than 10 years. May God grant them good health and happiness for many years for their dedicated service! We definitely miss their smiling faces. Judy Shuba and Very Rev. 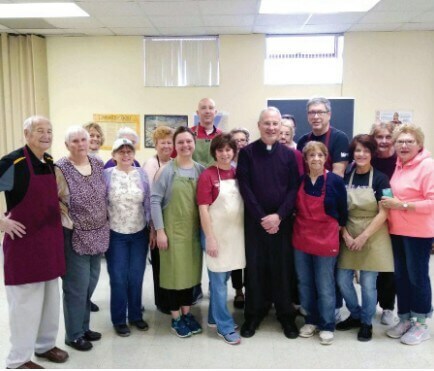 Joseph Raptosh, pastor, coordinate the ordering and finances and Mary Ruozzi and Judy Shuba have stepped up to take on the the most important dough making responsibilities. Father Joseph always checks in and praises the team who work so diligently for nine months for the benefit of St. Michael. Additionally, a special thank you must go to Joseph Raptosh, Sr. who dons his apron each Monday morning and helps out in the kitchen. If you happen to be in the neighborhood stop by or call 724-745-7117 and treat your family to one of the most delicious nutrolls in Washington County. On Dec. 16, St. Michael celebrated an early Christmas Eve black-fast dinner in the church hall following Liturgy. 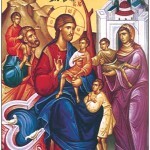 Father Raptosh greeted everyone with bowls of garlic and honey and passed out loaves of unleavened bread. Everyone participated by bringing fruit, salads, mushroom soup, bean soup and much more for parishioners to enjoy. Israel to whom shall come Emmanuel! Then the children were surprised with the appearance of St. Nicholas who presented gifts to each child. Some think St. Nicholas bears a resemblance to parishioner Mike Sosak. We as parishioners look forward to this gathering each year as a preparation for Christ’s birth on Dec. 25. Christ is born! Glorify Him!